Here are some photographs of the Moscow School of Management by architect David Adjaye, where four buildings precariously cantilever over a large circular base. 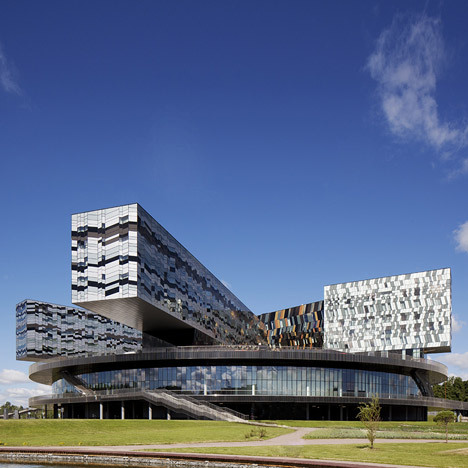 Adjaye, who was today announced as this year’s Design Miami Designer of the Year, completed the teaching and research institute in the city outskirts at the end of 2010. Classrooms and lecture halls circle a restaurant at the centre of the 150 metre-wide school-on-legs and a car park can be found below. The four blocks above individually house administration, a wellbeing centre, a hotel and student accommodation. The walls of the wellbeing centre display a herringbone patchwork of glass and coloured panels, while the other three blocks show the same patterns in monochrome. A private terrace is located on the roof of the school, surrounded by skylights into the rooms below. Other projects on Dezeen by Adjaye Associates include headquarters for design brand Moroso and a visual arts space in London - see all the stories here. This teaching and research institution was founded in 2005 to educate a new type of executive capable of leading Russian business through the 21st century. The founders were of the view that a campus-type development would best represent their aspirations and, with this in mind, acquired an open site in an area that is scheduled to become an advanced technology park, just beyond Moscow’s outer motorway ring. Situated in a wooded valley, the site has the idyllic qualities associated with those of a traditional campus but the severe demands of a six-month winter were a barrier to pursuing an arrangement of this kind. Rather than being in separate buildings, the main elements of the brief are therefore housed in clearly identifiable volumes that nevertheless form part of a single development. As a result of this strategy, the external appearance of the Moscow School of Management Skolkovo changes dramatically depending on the direction from which it is seen, but practical and visual continuity is provided by the 150metre-wide disc that floats above the site. Despite its size, the disc minimises the footprint of the development on the site, and softens the visual impact of the lower stories of the development, as only a small part of it can be seen at any one time. The disc itself is two stories high and the main teaching departments are distributed around its outer edge, with the larger spaces on the lower floor. Between departments, a series of wedge-shaped spaces connection the centre of the disc, where the restaurant area is located, and the perimeter. With directional rooflights above, these informal gathering spaces bring light and views deep into the interior. The disc also includes a conference centre with its own auditorium, and the roof of the disc is a landscaped open space. This replaces the area of the site occupied by the building, where a protected car park and service area are located at ground level. The group of buildings that stand above the disc give the development its characteristic profile when seen from different directions. Of these, the Wellbeing Centre occupies a pivotal position in anchoring the disc to the sloping ground on this side of the Setun River. Standing close to the edge of the site, its stacked recreational spaces still enjoy views of the river due to the splayed positions of the two residential buildings: student accommodation in the longer one to the north, and a five-star hotel that is linked to the conference centre below. The Wellbeing Centre is supported by the same structural grid as that of the disc, whilst the residential buildings are designed as bridge structures. Each of them is supported on two towers that cause minimum disruption as they pass through the disc to the ground; the consequences of this arrangement are visible in the long cantilevers at the ends of both buildings. A similar principle is employed in the structure of the administration tower, although the design of its facade is similar to that of the Wellbeing Centre. The gold colouring of the Wellbeing Centre reflects its importance in this powerful composition, an effect that is given further emphasis by a blue tinge to the facades of the residential buildings.